Guangdong: China’s Next Free Trade Zone? Guangdong wants to be part of China’s next free trade zone, but is the original version in Shanghai even working? Guangdong is hoping to become the home of China’s next free trade zone, Governor Zhu Xiaodan told state media last week. The proposed Pearl River Delta Free Trade Zone would encompass the special administrative regions of Hong Kong and Macao as well as parts of the cities of Shenzhen, Zhuhai, and Guangzhou, making it potentially much larger than the current free trade zone in Shanghai. According to Governor Zhu, feasibility studies on the proposed free trade zone have been going on for over six months. The plan received a boost, however, when the recent Third Plenum expressed general support for opening additional free trade zones in China. Though many believe that Li Keqiang had to fight heavy political opposition to open the original Shanghai Free Trade Zone, the Third Plenum’s comments promise broader support for future free trade experiments. Guangdong’s proposal is especially interesting because it would further link mainland Chinese cities with Hong Kong and Macao, which have their own special economic systems. By doing so, Guangdong leaders hope to capitalize on Hong Kong and Macao’s experiences with a free market system. Though both are part of the People’s Republic of China, there are stark differences in how their economies function. According to the Index of Economic Freedom issued jointly by the Washington DC-based Heritage Foundation and the Wall Street Journal, Hong Kong has been rated the world’s freest market economy for 19 consecutive years. By way of comparison, this year Macao was ranked 26th in economic freedom, and mainland China was all the way down at 136th. Still, the process of approving Guangdong’s free trade zone is likely to take months or even years. Guangdong Academy of Social Sciences economist Ding Li told the South China Morning Post that the Guangdong authorities are most likely to receive approval if they “think of what the central authorities really want from a free trade zone” and present a proposal in line with those considerations. So what does Beijing want from a free trade zone? 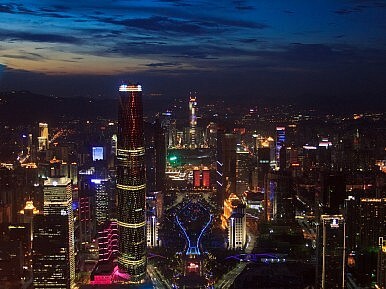 According to the Framework Plan for the Shanghai Free Trade Zone, the main goals are to “expedite the functional transformation of government, explore administrative innovation, stimulate trading and investment facilitation, and accumulate experience on achieving a more open Chinese economy.” In plainer English, the main goals seem to be opening up the service sector and allowing more opportunities for foreign investment. Shanghai Party chief Han Zheng told Caixin that the Shanghai Free Trade Zone’s crucial reform has been “to transform the government’s role.” Han added, “The most important task now involves reforming the administrative review system.” The free trade zone encourages investment by streamlining the lengthy approval process for new businesses. Businesses are allowed to register and begin operations immediately. The only exceptions to this rule are contained on the “Negative List,” which stipulates which economic activities are still subject to prior approval. Unfortunately, this is a long list. It includes restrictions on everything from the making of traditional Chinese medicines to the manufacture of automobile parts. Not surprisingly, one of the most sheltered industries is China’s entertainment sector: foreign companies are prohibited from investing in radio or television stations, film companies, publishing companies, news websites, or online audio-visual programming, and are even barred from the online gaming industry. Moreover, the financial services industry, which was supposed to be the backbone of the Shanghai Free Trade Zone, faces a lengthy list of prohibitions. Perhaps because of these restrictions, new projects have been somewhat limited in the Shanghai Free Trade Zone. Malca-Amit, an Israeli company with offices around the world, is planning to establish a new storage facility for luxury items, and major banking companies including Australia and New Zealand Banking Group, Citibank, Deutsche Bank, and HSBC plan to establish sub-branches in the free trade zone. Ultimately, the Shanghai Free Trade Zone poses an important test for a possible China-U.S. bilateral investment treaty, as Peking University professor Yiping Huang writes for the East Asia Forum. The experimental zone could also be a test case for potential Chinese entry into the Trans-Pacific Partnership, should that economic agreement ever reach fruition (for more on the challenges facing the TPP, see my colleague Zachary’s analysis). As I wrote earlier this week, the collapsed negotiations over an expanded Information Technology Agreement show how far apart China and the U.S. still are on trade issues. The free trade zones could help to narrow that gap, if implementation can live up to the hype. Accordingly, the next few years will be crucial for China’s experiments in free trade. Will the government slowly ease away from some restrictions, as Han Zheng expects? Will the central government be quick or slow in approving other free trade zones, such as the one Guangdong envisions for the Pearl River Delta? Will the reforms truly allow for market forces to play a larger role in China’s financial markets, including setting both the value of the RMB and interest rates? The answers will provide a clue for the economic ambitions of China’s top leaders. In that way, the fate of the Shanghai Free Trade Zone and Guangdong’s proposal for a new one could be more definitive than any declarations made after the Third Plenum. China's central government has reportedly approved 12 new free trade zones, including ones in Tianjin and Guangdong. Can China Save the Shanghai Free Trade Zone?Xi's Scary Interpretation of the Last 40 Years of Chinese History12 Regions of China: The Southeast CoastWhat's Behind the Latest Political Reshuffling in Southern China?Chinese Democracy: Is This How the 'Wukan Moment' Finally Ends?